At 1:00pm on Saturday, April 26th, concurrent with rallies in thirteen other communities around Montana, Missoulians will rally at the XXXs on North Higgins for Montanans for Climate Solutions, a multi-community event that will call on state and federal officials to take decisive and clear action to reduce dangerous carbon pollution and support proactive steps to solve the climate crisis. Montanans from all walks of life will come together to urge our decision-makers to embrace renewable energy, as well as energy efficiency and conservation policies that move us towards a clean energy economy. We’ll send a clear message that it’s time to move away from dirty energy projects like Arch Coal’s proposed Otter Creek Coal Mine. Speakers at the rally will include Missoula Mayor John Engen, Nobel Laureate Dr. Steve Running, Indian People’s Action organizer and UM Professor of Native American Studies Dr. George Price, and others. With officials poised to make crucial decisions about whether to move forward with destructive energy projects like the Otter Creek Coal Mine and the Tongue River Railroad coal export project, now is a crucial time to show that Montanans support solutions to climate change. Please come to the rally and help us send the strongest possible message! Not in Missoula? 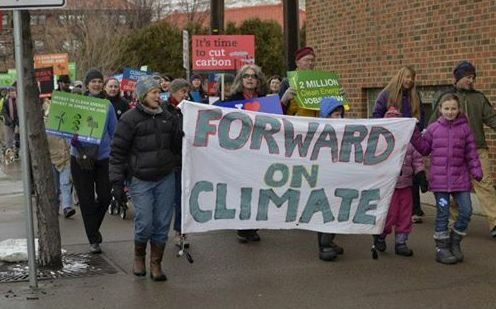 There will be Montanans for Climate Solutions in thirteen other communities, too. Click here to find a rally near you.